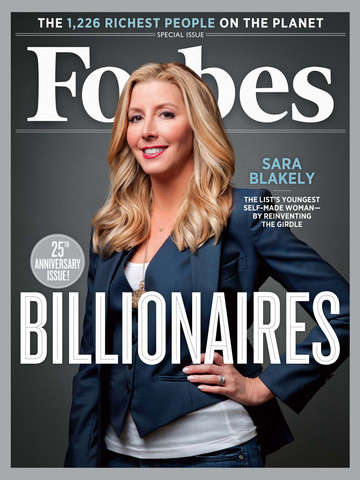 We had some particularly exciting news this week – an article on PlayDNA co-Founder Dr Samantha Decombel was published by Forbes magazine! The article, written by Lorraine Sanders, Contributing Writer for Women 2.0, documents the journey of Dr Sam from her PhD at the University of Birmingham, to part-time Lecturer in Evolutionary & Conservation Biology, all the way through to the current day, in which novel artwork genetic company PlayDNA is really taking off alongside a new spin out you’ll be hearing much more of very soon – MuscleGenes! Our ‘Ask The Scientist’ series continues with another question from the students of Irchester Community Primary School, Northants. Last week we tackled an excellent question from Morgan on why we all have different DNA. This week our question comes from Brooke, and it’s another cracker! Why is DNA in a double helix? The DNA double helix – but why? Has it ever occurred to you why DNA is in a double helix? Nope? Me neither. It is one of those things we have always taken for granted, we don’t question it, it just IS. Which is why it sometimes takes a young and questioning mind to bring such an oversight to our attention. So we put our heads together here at PlayDNA and had a good think. We decided there are a couple of different ways we could approach Brooke’s question. We could look at it from a chemistry perspective and ask how, chemically, the helix is formed and what chemical or physical forces cause it to take this shape. Or, we could look at it from a biological perspective and ask why, evolutionarily, it was this particular structure that we ended up with. We’ll take a look at each in turn, but before we get stuck in, let’s take a moment to remind ourselves what DNA actually is. DNA is organised as two long strands of bases which twist around one another to form a double helix. DNA bases pair up with each other, A always with T and C always with G, to form units called base pairs. This is all held together by a sugar-phosphate backbone. DNA, which stands for deoxyribonucleic acid, is the complex chemical that carries our genetic information. It is a bit like an instruction manual for building the body and keeping it healthy. We keep an entire copy of our DNA code (called our genome) in almost every cell in our body (wow!). The information, or blueprint, for building a human being like you or me is stored in our DNA as a code made up of four chemical bases: adenine (A), guanine (G), cytosine (C) and thymine (T). These bases are joined together to form long strands, which wrap around one another to form the helix shape we are so familiar with (a bit like a twisted ladder). The human genome consists of around 3 billion pairs of these bases! Essentially, it is the order in which these bases are organised in our DNA that tells our cells what to do. The basic chemical principle behind why DNA forms a double helix is actually relatively straightforward. As we can see from the diagram above, DNA is essentially made up of three parts: sugar, phosphate and bases. It is the way in which these different molecules react to water that is key to the helical shape. Let’s look at our sugar molecule first. We all know that to sweeten our tea or our fizzy pop, sugar has to dissolve in water. When something is able to dissolve in water, it is called ‘water-soluble’ or ‘hydrophilic’. Next comes the phosphate. You might not have heard of phosphates before, but they are really very important! Phosphate is a major nutrient required for plant growth and is a common addition to plant fertilisers (have a look at the bags of compost next time you’re at the garden centre). See what a difference it can make to how well these plants grow! Phosphates are involved in virtually every cellular reaction in our bodies and are key building blocks for many cellular compounds (including DNA of course!) They are absolutely essential to human, plant and animal life. Just like the sugar, phosphates are able to easily dissolve in water too. Finally lets consider the bases. You might have guessed by now, the bases are the opposite of the sugar and the phosphate – they hate water! They are ‘hydrophobic’ and do not dissolve in water. So what happens to the bases when you put them in water? Something very similar to what happens when you mix oil and water – they pool together and don’t blend with the water at all. But most of the space in our cells is filled with water, so how do these ‘hydrophobic’ bases exist in our cells? Well, once they are attached to a sugar and a phosphate (to form what is known as a nucleotide) they arrange themselves in such a way as to be as far away from the water as possible. Where is this? Why in the centre of the molecule of course! The water-hating bases stack themselves in the middle of the molecule while the water-loving sugar and phosphate backbone sits on the outside. But there is another problem. The DNA strands arrange themselves so the water-hating bases are tucked away safely in the centre of the molecule and as far away from the surrounding water as possible! If the bases just stack themselves (like a ladder) this still leaves space around the bases through which water can sneak in – and the bases don’t like that! They naturally form a position that keeps them all as far from the water as possible, just like the way oil will clump together on top of water. The most efficient position the molecule can form to do this is – you guessed it – a helix, as the ‘twist’ in the molecule closes up and minimises those gaps through the middle. So that is why, chemically, DNA forms a double helix. It’s all simply down to the way the molecule interacts with water. But there is another, less direct way to look at this question. A biologist (and we are all biologists here at PlayDNA!) would perhaps ask why it is this particular structure that has endured over any other type of molecule. Why has life evolved to use bases arranged in a double strand to carry our genetic code and not some other formation? Why a combination of water soluble and insoluble chemicals? In short, why is the DNA double helix so perfect for carrying our genetic information? So that the cell can ‘read’ the instructions contained within the DNA and tell it what to do. So that the strands can be used as a template to make a whole new copy of the DNA code for a new cell – a process called ‘DNA replication’. Unbelievably, each and every one of us developed from just a single cell. We all start out life as just a single cell complete with the original DNA copy we got from our mum & dad! As we develop, our cells duplicate, and each new cell needs its own copy of DNA to tell it what to do. That’s a LOT of copying! To make new copies of your DNA code, the DNA-helix is first “unzipped”. Each half will then be the template for a new, complementary strand. Biological machines inside the cell put the new bases onto the split molecule and also “proof-read” the result to correct any mistakes. The final result is two exact copies of the original DNA molecule! From that single cell, an individual grows to around 100 trillion cells (! ), and almost every one of these cells contains an entire copy our DNA (remember there are over 3 billion bases in just one copy). That is a lot of DNA for our bodies to read and copy! It is really important then that we keep any errors in this copying to a minimum, as at this rate errors can build up quickly, and errors in our DNA code – or mutations as they are also known – are usually a bad thing. In this regard, being double-stranded helps in at least two ways. Oops, an A base has been accidentally put in the new strand of DNA instead of a C base! The double stranded nature of DNA keeps these errors at very low levels, but they do still happen in our DNA all the time. Luckily most of these mutations are harmless, as they don’t occur in the important areas of our DNA. Firstly, as we know, it is the chemical bases A, T, C and G that carry the DNA code. If the DNA molecule were single stranded, this important part of the molecule would be exposed to the cellular environment, which would mean a higher likelihood that it could get mutated by the numerous chemicals there. In our double stranded model however, the precious bases are kept locked away within the complex, keeping them safe from the harsh external environment. Secondly, as we saw earlier, the two DNA strands that form the helix are essentially complementary copies of one another. An A base on one strand always pairs with a T base on the other, and likewise C always pairs with G. Having two complementary strands facing each other means that our cells always have a back up; a way to check that our DNA has been copied correctly. It allows for a level of ‘proof- reading’ of the DNA sequence so some mutations can be corrected, or at least limited. In summary, the double-stranded DNA helix is a winning combination for packaging genetic material for the long term. It keeps our DNA code as faithful to the original as possible with its ability to be copied precisely and without errors, and offers some protection against mutation. It is perhaps no surprise then that almost all organisms – plants, animals, yeast and bacteria – carry their genetic information encapsulated as DNA: it is the perfect molecule for the job! If you have anything to add, or any more questions on this topic, please do feel free to comment below! 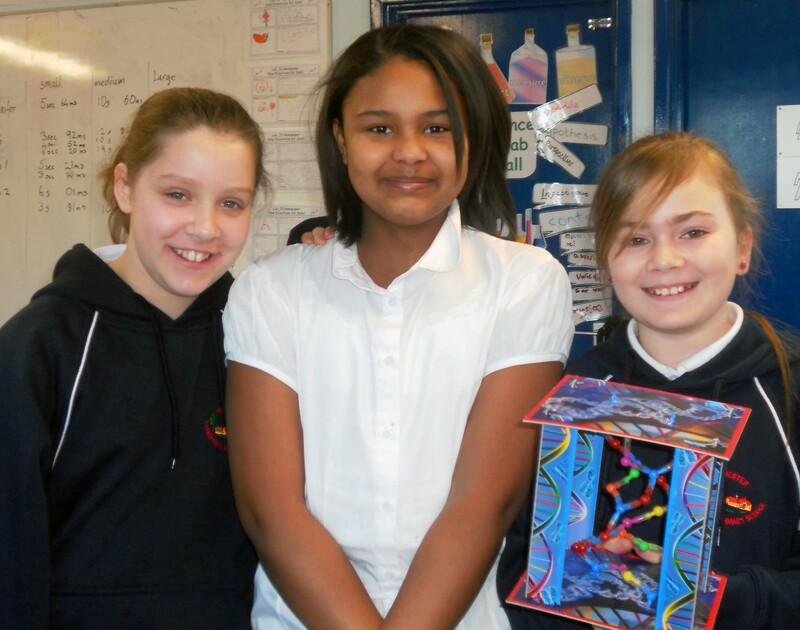 Following my recent interview with the Lab_13 children of Irchester Community Primary School I was lucky enough to receive three such questions from three very bright and talented young ladies. Together with my colleagues Dr James Sleigh and Dr Stuart Grice, we have prepared responses to each of their questions in turn. To make them a little easier to digest, I will post one a week. Our first question comes from Morgan, age 11. We hope you enjoy reading them, and feel free to add your own thoughts below! I know we all have different DNA but why? Why do we need to be different? Everybody does indeed have different DNA, and that is one of the things that makes you unique and who you are. However, the sequence of your DNA is almost 99.9% similar to that of another person. That means that if you were to look at the letters that make up your DNA and my DNA, 999 out of 1000 are likely to be the same. This percentage gets even higher when you compare your DNA with a relative. If you go in the opposite direction and compare yourself with a chimpanzee, the differences become bigger and that similarity percentage goes down. I’m sure you’ve all heard of people tracing their family histories and drawing a family tree. Well imagine doing that and going back a few million years. Eventually, you would come across an ancestor that you share with a chimp! Now keep on going. If you were to go back billions of years until your tree includes every animal that ever lived, you would have drawn the “Tree of Life” and you would be able to see how life on earth has evolved, and how new species came to exist. And this is why we all have different DNA and need to be different. For a species to be able to survive and thrive, it needs to be well adapted to its environment. Think of an African elephant with its large ears to improve heat loss and a polar bear with its extremely thick fur to keep it warm. Each species has many ‘adaptations’ in order to survive. If you were to swap the two and put an elephant in the Arctic or a polar bear in Africa, neither would live for very long! Perfectly adapted to their environment, but not so good in each others! These adaptations have come about because of evolution by natural selection acting on their DNA. It is actually the genes in DNA that result in the different characteristics we see in all species. A gene is simply a short section of DNA that tells our cells what to do. If you think of your DNA as a recipe book, the genes are the individual recipes. Each of us has the same set of genes – about 20,000 in all. The differences between people come from slight variations in these genes. Differences in our genes, which can come about through natural mutations in our DNA, lead to new characteristics. A lot of these changes may be bad, but some may be good, and improve the chances of an animal surviving. Those animals with genes that improve their chances of survival will be more likely to live long enough to pass on their DNA to their children than those animals that don’t possess the advantageous genes. – what colour are the moths near you? When this selection of genes occurs over long periods of time, animals within a species can become more different from each other until two groups form that can no longer have children together. When this happens, new species have formed. The differences in human DNA allowed our species to adapt to the environment over generations. If we go back a few thousand years, when there were no computers, or telephones, and we were living in small huts and caves, life was much harder and there was much more danger in the world. If we all had the exact same DNA, we would all be very similar in our appearance and our physical and mental abilities. That means that we would have been much more likely to die out as a species if a life-threatening change in our environment occurred, perhaps a new disease that no one was immune to for example. Monocultures are plantations of genetically identical plant species: what do you think will happen to this crop if it was attacked by disease? However, having small differences in our DNA means there is a chance that some people could be immune to that disease. If attacked by a large predator like a lion, it would be those who could run faster that would survive, or maybe those who were smarter and able to hide better. These individuals would be more likely to stay alive long enough to pass on their advantageous genes. Being different then is a good thing, not only because it means that life is a little more exciting with the diverse range of people you get to meet, but also because we are more likely to survive into the future as a species! Earlier this month I was contacted by Scientist in Residence Jennifer Hogan on twitter. Jennifer, as I found out, runs a very special science lab for primary children in Northants called Lab_13. Lab_13 is a space dedicated entirely to investigation, innovation and creativity; a space managed by young people; a space led by young people. What a fabulous concept I thought! 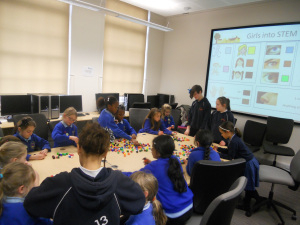 Jennifer invited me to be interviewed by some of the children on the Lab_13 committee about my career path. They were particularly interested in how I had combined my dual loves of science and art. Of course I agreed, as there is nothing more satisfying than being able to help enthuse and encourage young people to get involved in science! 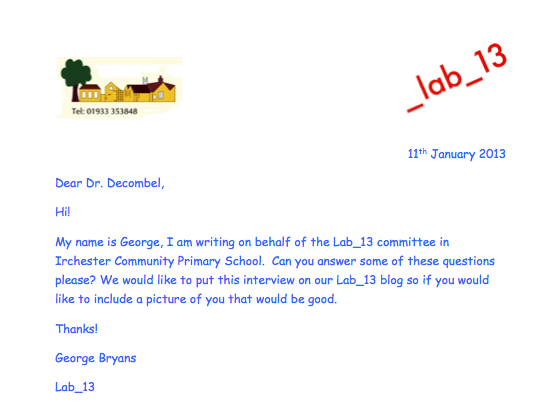 Thanks Jennifer, George and everyone at Lab_13, it was an honour to be asked and an absolute pleasure to get involved!